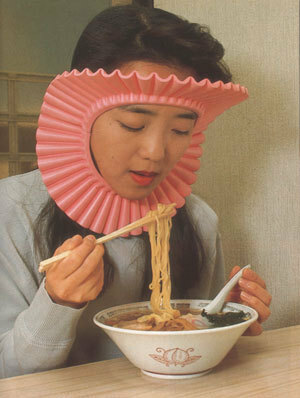 Some incredible—or incredibly useless—inventions have come out of Japan, like the ramen face shield. But this “Super Upward-Looking Dozing Desk,” discovered by Kotaku, is something every lazy technology user would love to own. The contraption brings us one step closer to becoming the pod people from Wall-E. The Dozing Desk forms a kind of armature over your prone body in bed. It holds a laptop precariously above your face with the help of elastic ties (hopefully secure enough to keep it from falling on you, which it looks poised to do). Your eyes now have a straight line to the screen even while laying down, and your keyboard is perfectly aligned to your hands. The only problem might be a lack of circulation to your arms, but you don’t type that much anyway, do you? The desk apparatus looks funny, but there’s a burgeoning line of products for those who don’t want to do their computing while sitting—which, after all, kills you slowly. The Zero Gravity Desk kind of looks like a dentist’s chair, with its various arms and levers. But it’s designed to keep your body perfectly balanced and unstressed while working, and who wouldn’t want that? These devices are the closest thing we have to becoming floating brains in tanks, controlling our digital lives through the power of our thoughts. Before we achieve that singularity, there’s always the bed-desk. Or at least these prism-spectacles that let you read while laying down.